I don’t like Sonic the Hedgehog. I don’t like most 2D platformers anyway, but I especially don’t like Sonic. The games are never what I wanted them to be – they’re actually relatively slowly paced precision platformers and not just “run stupidly fast at all times” – which is, admittedly, entirely my fault and not the games’ so much, but I’ve never enjoyed them because of it. Getting that out in the open is important because Sonic Mania actually comes really close to being the 2D Sonic game I always wanted. It is fast and frantic and most of the levels are designed to let Sonic do what he (allegedly, supposedly) does best, which is go fast. It isn’t all loop-de-loops and high speeds, though, and some core series design issues creep in during the second half, but I can still easily say Sonic Mania is the best Sonic game I’ve ever played. For all of the details, continue reading our Xbox One Sonic Mania review. Sonic Mania is, basically, an officially sancationed fan game where indie dev Sonic superfans were given the green light to make a “real” Sonic game. Because the developers are die-hard Sonic fans, they know the good and bad of 2D Sonic and did their best to emphasize the good parts. I can happily say they were mostly successful. 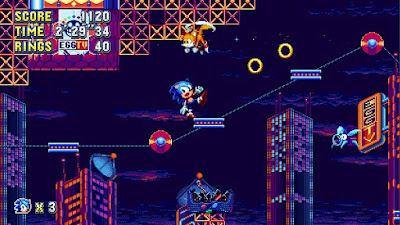 Sonic Mania features both remixed versions of classic levels from Sonic the Hedgehog 1, 2, 3, Knuckles, and CD as well as brand new levels. The classic levels, such as the iconic Green Hill Zone 1 from the original Sonic the Hedgehog, had to be slightly altered to make use of the new gameplay abilities and gimmicks introduced by the dev team. The result is classic levels that flow better and play better than ever before. The brand new levels are even better, and easily the best part of the package, though, because they were built from the ground up to take advantage of Sonic’s best features and are some of the fastest, most fun, most high flying, and exciting 2D levels the franchise has ever seen. As mentioned above, my favorite part of Sonic the Hedgehog games is always going fast and flying through the air, going through loops or corkscrews or other obstacles, and generally just tearing around with reckless abandon. That isn’t what most Sonic games are actually about, though, which always led to frustration. Sonic Mania, on the other hand, allows me to play like that far more often and consistently than any previous Sonic game, and I freaking love it for that. 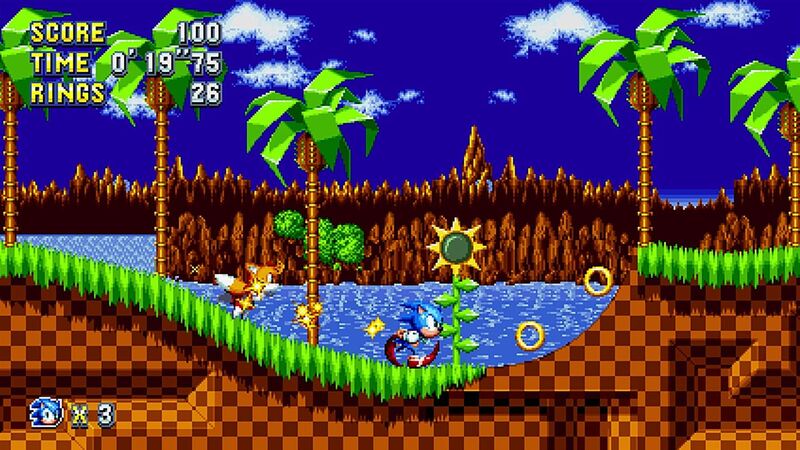 I also really like the new bonus stages – entered by finding hidden giant rings in each level a’la Sonic 3 – as they shift to a 3D behind the back perspective and have you racing around a course trying to catch a UFO holding a chaos emerald. These stages are fun! The classic Sonic 3 bonus stages are also included as well. 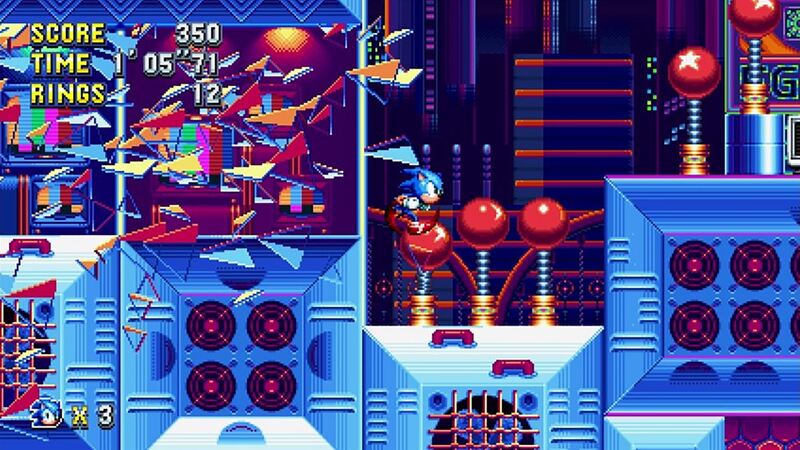 Unfortunately, the further I got into Sonic Mania the more things started to fall apart. The game has around 12 zones, each with 2 levels, and each level has a boss fight. For the first half of the game, I was super into it. The levels are fast and fun, the boss fights are fun (and fair) and I had a great time. In the second half, however, the level designs are undeniably weaker and frustration started creeping into the boss fights as they were no longer as obvious about what you were supposed to do. The second half of Sonic Mania also more heavily features platforming instead of speed a lot of the time, which is absolutely the weakest aspect of the Sonic franchise. Sonic’s slow floaty jumps are the opposite of precision, yet the game demands precision, and awkwardly bouncing off of walls / jumps / enemies because of wonky physics just plain feels awful. I assume they included these levels / sections because they’re oldschool and authentic, but it just reminds me of why I don’t like the franchise much. Kind of a bummer that Sonic Mania stumbles in the second half after I had so much fun at the start. I would still have to say I enjoyed my time overall with Sonic Mania, though. When it’s good, it is really, really good and easily the best the 2D Sonic franchise has probably ever been. I’ve had fun with it. I also really like the extra features like being able to play as Sonic, Tails, or Knuckles and the competitive and cooperative multiplayer modes. I also really appreciate that the game has unlockable features and secrets modes and actual honest to goodness cheats just like oldschool games always used to have. Sonic Mania is a love letter to 90’s gaming. Presentation wise, Sonic Mania is pretty fantastic. The visuals are a 16-bit blast from the past and offer a few filters to make it look as authentic as you’d like (I kind of like the smooth modern look). The music is also spectacularly good. The game overall is bright and colorful and happy and full of joy, which really stands out these days. All in all, Sonic Mania is pretty easily my favorite Sonic game and probably the best Sonic game ever. I genuinely liked it quite a bit, which should carry some weight since I am not a Sonic fan. At all. For a crusty old Sonic hater like me to enjoy Sonic Mania this much is saying a lot, I think. It also means that if you’re already a Sonic fan you’re going to go absolutely nuts for Sonic Mania. Sonic Mania is Sonic at it’s best. Buy it.